Typically Tables of 8 people, using 60″ rounds or 8′ banquet tables, will require 100 square feet per table or 10 square feet per person. Additional room would be needed to add in a dance floor, band or DJ. Ceremony tents require different seating arrangements. You can usually factor 8 square feet per person if using a cathedral style seating setup with an aisle. We can help you with this so that you have exactly what you need. For events held over the weekend, we generally schedule our deliveries for Wednesday – Friday and pickups for the following Monday or Tuesday. Classical Tents schedules these days based on availability and size of your order. If you would like to request a specific delivery or pickup day, please do so three months in advance (we’ll try our best but we can’t guarantee we will be able to accommodate you in this request). If you prefer, we can also schedule a customer pickup and return of your rental order at our warehouse. There is no delivery fee associated with this service. Vintage China, Vintage Hobnail Glasses, Rustic Farm-top Table. Photograph by: Tricia McCormack Photography. Most orders will be charged a delivery fee based on delivery location. Please contact us for appropriate charges. You may avoid a delivery fee by picking up and returning items to our warehouse. Are there sides on the tents? White, windowed and clear sidewall panels are available for an additional fee. The sides are constructed of the same material as the tent top. Depending on the style of tent that you have rented, they can be folded back, rolled up or slid open on a track. There is no additional cost for our staff to hang the sidewalls upon delivery and we’re happy to do it! Does the tent have a floor? Tents are most commonly erected on grass, pavement, decks and patios. Please contact our office to discuss options for adding a floor to your event. All events receive up to three computerized floor plans at no additional cost. There is a $20.00 charge for additional plans. Call today at 1.800.70.TENTS to speak to one of our staff today. Why would I rent a structure instead of a tent? Structure tents are the sturdiest tents on the market, and their sidewall panels open and close on a track. Tensioned sidewall means no flapping and a clean, tight look. They are highly weather resistant and are 10′ tall at the sides. Elegant and sturdy, structure tents might just be the tent for you! When do I need to finalize my order? Final changes should be made no later than one week prior to your event. Our Rental Coordinator will contact you at this time to review your order, get any final changes you may have, let you know when we are planning to deliver and discuss final details for your order. Longer lead time may be required on certain items such as specialty linens. All orders are booked upon receipt of a 30% deposit of the total bill. The remainder will be collected prior to setup of your event. Customers may pay by check, cash, Visa or MasterCard unless credit has been established at least 60 days prior to delivery. Do the tables and chairs get set up? 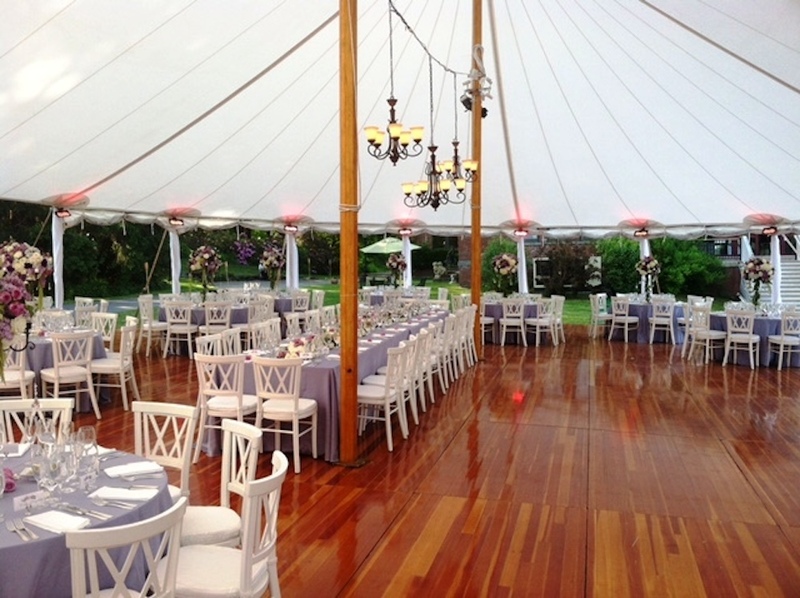 Classical Tents can set up your tables and chairs for you provided your request allows us ample scheduling time (there is an additional set up fee). Otherwise, items will be delivered neatly stacked. We ask that you restack the items after the event to avoid clean up costs. What should we do for clean up? We ask that tables and chairs be neatly stacked to resemble the way they were delivered. Glasses should be tipped upside down and placed in their appropriate racks so that all liquid drains out. Dishes should be scraped free of all food particles, rinsed and placed in their appropriate racks. Linens should be shaken free of food and crumbs and placed in the supplied linen bags. DO NOT put linens into plastic bags as mold will result. Tent permits are required based on the town your event is being held in. Obtaining a permit is the responsibility of the customer. Contact the local building inspector’s office to find out if one is required for your event site. We are available to assist you in filling out the form and providing any necessary paperwork required about the tent itself.